Doug Collins, the next Sixer Coach? According to a source: Doug Collins has offered his name up for the vacant Philadelphia 76ers Head Coaching position. He specifically said that ‘Yes’ he would coach the Sixers if the job was indeed available (we all think it is) and they offered him the position. Well heck Doug, let me toss my name out there too to be in the running. Hey Ed Stefanski, Ed Snyder, I will also take the job if it is available and you offer it to me, and for way cheaper then what Doug Collins wants. Anywaaaaayyy, I think Jimmy Lynam gets the gig. He was basically calling all the plays anyway. But really, Ed and Ed, this is for you. Hire me. I’ll gladly accept and work these boys to the bone. Bring this great city a real championship, a BASKETBALL championship. Put Philly Ball back on the map BAY BAY. Comments Off on Doug Collins, the next Sixer Coach? A Trade in the Making? Hey according to the ESPN Trade Machine, it works. God I hope this happens, as much as I like Andre Miller, I would love to see Baron Davis running this offense. Imagine the starting lineup of Baron Davis, Andre Iguodala, Thaddeus Young, the rook Mareese Speights, and Marcus Camby. Look out Boston, you got something to worry about in the Atlantic now. PULL THE TRIGGER STEFANSKI! Comments Off on A Trade in the Making? 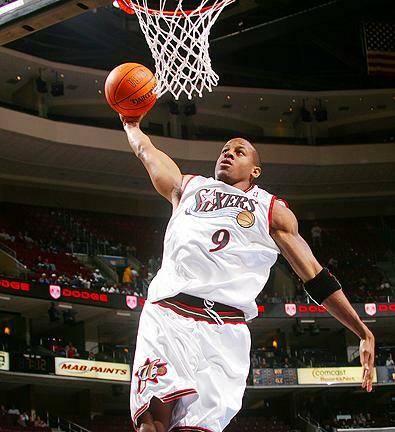 The Philadelphia 76ers and restricted free agent Andre Iguodala have agreed to a six-year, $80 million contract, league sources tell ESPN.com. FINALLY. The last piece to the puzzle has been inked and the Sixers are looking to have a very dominant starting squad to throw out on the court next season. $80 mil was a tad high in my mind in terms of salary for a player like Iggy, but he did average 20/5/5/2 steals last season with NO help and has only missed 6 games in his first four seasons. He continues to improve every season and he now has some established running mates along side of him. I’d much rather give the money to someone like Andre then see Stefanski blow it elsewhere (i.e. Erick Dampier $65 mill, Adonal Foyle $55 mill or even Rashard Lewis $118 mill). A source confirmed Thursday that the Sixers have locked up one of their two restricted free agents and signed guard Lou Williams to a five-year contract. Additional terms of the deal were not known. Williams averaged 11.5 points as the first guard off the bench for the Sixers. Although he wasn’t a starter, the slender 6-foot-2, 175-pounder often finished games during his third NBA season which garnered him some national attention this offseason. Ed Stefanski must now focus on re-signing the key to the starting five, the spark on the court, Andre Iguodala. Stay posted for updates. UPDATE: Derrick Gunn on Comcast SportsNite is reporting that the deal is worth $25 million over the 5 years. The Sixers reached an agreement with journeyman Royal Ivey for the minimum contract. The 6′4″ guard will join Willie Green and Louis Williams as combo guards coming off the bench for the new-look Sixers next season. Ivey, 26, spent last year with the Milwaukee Bucks averaging 5.6 points and 2.1 assists in 75 games. Offense isn’t his forte but he prides himself on defense. I know the Sixers had to sign somebody since they only have 9 players under contract, but I hope management has their priorities straight. Signing Iguodala and Lou Will have to get done or this offseason tastes a little less sweet. We had a little scare with Lou Will, but the Warriors opted to go with Marcus Williams. Hopefully, Louis doesn’t take note of other signings and get any ideas of raising his asking price. My question is, were there no guards that could shoot that were cheap? NBA front-office sources told ESPN.com on Tuesday that Brand has informed the Sixers that he will accept a five-year deal worth an estimated $82 million and spurn what was presumed to be a slam-dunk return to the Los Angeles Clippers to hook up with Clipper-to-be Baron Davis. The Sixers cannot formally sign Brand before midnight, with Wednesday serving as the first day that NBA teams can officially complete signings and trades after the lifting of a league wide moratorium which began July 1. Sick pickup by Ed Stefanski which makes me very excited about what lies ahead for this team. Ed, a Philadelphia native, came in here with a mission; to bring the basketball fans of the City of Brotherly Love something that has not graced the court for a long time here in Philly, a true low post presence, and he did just that. Not since the days of Charles Barkley and Moses Malone have we had a dominant scorer that commands attention at the four-spot. I sense Ed has something else up his sleeve and I have a feeling there are more great moves ahead before the beginning of the 2008-2009 NBA season for YOUR PHILADELPHIA 76ERS. Pros: Kevin Love is truly a consistent player, scoring in double figures in all 28 games he’s played in his freshman season. Averaging 17 points and 11 boards in almost 29 minutes per game, Love is also very productive. Love’s inside game is powerful and his goto move is a baby hook that is very difficult for college players to defend. He’s got terrific footwork in the paint and can be dominating rebounder on the offensive and defensive glass. Love’s inside game allows him to shoot over 58% from the field, but he’s a more versatile player than that. He can also step outside and has range out beyond 20 feet. Love is hitting almost 36% of his 3-pointers this year and over 74% of his free throws which is incredible for player of his size. Love is also an excellent passer and can pass out of double teams or run a high post. Cons: First of all he doesn’t have great court speed. While his size is sufficient to dominate the paint in college, he won’t be big enough to play center and dominate down low in the League. He will have to line up at PF and could have a tough time trying to guard the quicker PF that has evolved in the NBA. He’s had knee problems in the past and isn’t the best-conditioned athlete in college hoops, though his freshman status may have something to do with that. Notes: According to Ed Stefanski yesterday on WIP, the Sixers are in dire need of a PF. This guy could come right in and be the guy that we need. He has great basketball IQ and even though hes a youngin’, K Love could be on a NBA court near you come next season (depending on where hes projected, he might stay). His ability to rebound and outlet the ball is simply remarkable. He would fit right in with the way the Sixers have been runnin’ and gunnin’ lately and be a great person to start the fastbreak with. 215 SportsGuy on Tyreke Evans – Next Star or Next Murder Victim? Jared on Tyreke Evans – Next Star or Next Murder Victim? Philly Sports Blog | 215 Sports · Two dudes with bad attitudes bringing you sports as it pertains to the Two One Fifth region of Pennsylvania, known as Philadelphia.